We have just experienced the newest children's play centre to hit Singapore, The Polliwogs, at East Coast Park. I was a little skeptical, thinking it was going to be a direct copy of similar places in Singapore, but was pleasantly surprised. This new venue has a few special features that make it unique and a real treat for kids. My kids had a blast, and even 9 year old Maya who is becoming conscious of being too grown up for 'baby' play centres, loved it. The area is bright, spacious and roomy, totaling some 6,500 square feet, with three party rooms (see below for party details) and an outdoor Polliwobly, a bouncy 'pirate ship' (to be rotated with an even bigger bouncy castle every month). Once you enter the picket fence you are in a kids' wonderland. Colourful rainbows decorate the walls as well as the four Polliwog characters who pop up everywhere, Rocky, Poco, Larry and Bobby. There are super cute child-sized sofas and lounges let little ones enjoy a snack or a drink. There is also plenty of room for mums and dads to relax with laptops or magazines (provided). The indoor play area has two or three levels of climbing equipment, with lots of tunnels and obstacles as well as a toddler area with a ball pit and level area for play. The three story area is special and a real hit with my kids as it has firstly, a very fast spiral slide from the third level, and also a 'volcano' which pops ball out of the top when you put them in. But what really grabbed the kids' attention was the ball guns, which shoot the little rubber balls that you load. I wish I could think of something a little more "PC" to call them, but guns they are, if big brightly coloured pink and yellow ones! They are strategically placed at different levels so that you can aim them at whoever you like with the balls. Small plastic buckets are provided to collect the balls and take them up to the level of the guns. Just the game of collecting the balls keeps little ones occupied, but the task of climbing up with their bucket is a skill in itself. The outdoor Polliwobly bouncy castle was fun, although during the day it would be too hot to use. We were there at around 5.30pm and it was great for about 15 minutes. The mist fans helped as did the cloud cover. This is a very bouncy castle and the kids were literally flying off the sides, so for very little ones I would watch carefully, especially when it gets busy. There is no cafe on the premises, but there are two self service vending machines with drinks such as juice, milk, milo and snacks consisting mainly of crisps and biscuits and yogurts. There is also free tea and coffee for adults, and I was pleasantly surprised with the quality of the coffee, although you will have to put up with powdered milk. This is a place where I could happily spend a few hours working on my laptop or reading while the kids played. It is lovely to be able to sit and watch the world go by through the large windows. People cycling, skating, jogging in the park, as well as the water and trees all make for a pleasant scene. There is also a nice al fresco area to sit if you feel like braving the heat, although I'm sure most will opt for the air conditioning. 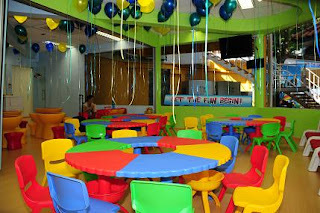 Polliwogs has three fully decorated party rooms which can be opened into one huge area for a large party (subject to availability). Packages start with Poco's Petit Party, costing SG$650 on weekends and public holidays and $500 for weekdays. All packages include free unlimited entry to all areas for up to 15 kids (extra $30 for additional children), food and drinks for the children, two dedicated party hosts, cake cutting ceremony, fun games, a special gift and photo momento for the birthday child, and personalised invitation cards. Book a party, fully paid in advance and get a free unlimited pass until the birthday date (maximum 3 months). This pass gives you unlimited play all day on the weekends as well as the week days. Each Polliwogs Value Play Pass gives you 6 visits and costs SG$105 (works out $17.50 per visit) and is fully transferable. Polliwogs is running a super opening promotion where they will give you one free visit with every Polliwogs Value Play Pass purchased. You can also buy the Play Pass for the special price of SG$79.90 (U.P $105) until the end of June. This is great value as it works out to be just over $11 per visit. Great incentive to get down to Polliwogs this weekend! Thanks for your response. Oh so Polliwogs is very very new! No wonder we didn't hear of it before nor could find information on it on the web. Would be a good idea to have your opening times on the website or an answer phone message. I have added the opening times here, thanks for pointing that out. The Polliwogs website is under construction at time of writing which is why there is not information available yet. how about babies below 1 yr old? can they go in free? wat about accompanying adults? Yes, I think this would be a great place for a 7 year old's party. You will need to contact Polliwogs though and perhaps have a look around or take your son there for a play to see if he likes it. Parents nowadays look for freebies or promotions. Is there any promotions going on such as credit cardholders? It will be nice if the web page can constantly update this information on special discount avaialable. Juz been there yesterday so gave some commnents. Place not as big as I thought which I think is pretty good for me coz I don't hv to 'babysit' my 3 years old son. I just sit in the cafe area. There is no way he can run out of the place as he needs to pass through the cafe. I think it is more suitable for younger children, not for older kids. A few guns are not working and I don't see any bouncing castle. Coffee quality is not bad but no powdered milk. Only 1 computer having internet access. But they actually allow ppl to bring in outside food which is good otherwise we will be starving. Place is pretty clean and the staff are friendly. They bothered to clean up a whole section and changed all the balls on hearing a child has vomitted. Kudos to them. Brought my kids there today and they totally enjoyed themselves. However there was a couple sitting near the entrance of the aircon part of the play area groping each other from 4 till 6pm while their son was playing. It was so disgusting and so inappropriate for this play area for children. I wish the staff at Polliwog could have told the parents to behave themselves since they are in plain view of kids. wow that is fun.very fun for kids of course.i would probably bring my child there someday.i hope they like it. Don't understand why "guns" are necessary for a kids play area. Hello.. do u all think this place can accomodate 100 kids at one go? Will it be too cramped? I just brought my son today and the price has went up to $8. As of today, the price has shot up to $10! Oh well, I do think some maintenance would be good.. Especially with higher entrance fees!